Now that the winter chill has started to subtly creep in, it’s important to be extra diligent about moisturizing. Dry skin does not only feel gross, but it makes you look older and its favorite time of the year to creep up is in the winter. A great way to combat dryness is by coating yourself in coconut oil. It’s super moisturizing and oh so natural. Unfortunately, there’s a few things about coconut oil that really turn me off. First of all, I hate the smell. This might seem blasphemous to many people but I just do not like anything coconut related. I don’t like the smell and I don’t like the taste. It might be because the first time I got sick from drinking, I had a bit too much Malibu Rum, but I just can’t stand the smell. However, I’ve read so much about the benefits of coconut oil that I decided I wanted to try it anyway. Another thing I don’t like about it is how greasy it is. When lathering on after a shower, I feel like a slip and slide. I certainly don’t want to leave the house looking like a big old grease ball, so I had to figure out a way to combat this. Due to some innovative thinking, I figured out a way to deal with both the smell and the grease. Instead of applying coconut oil to my body by itself, I now mix it with my regular body lotion. 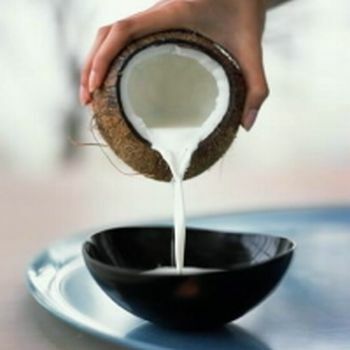 It’s a great way to cut down on the coconut scent by mixing it with the scent of my own lotion and it greatly cuts down on the oil factor by making it easier to sink into my skin. I highly recommend applying this combination after the shower and before bed to combat the icky dry skin that winter brings on. What do you do to combat dead winter skin? Leave it in the comments below!